Make them realistic and attainable. Create a plan to achieve them. Exercise for yourself, not someone else. For you to be successful, your motivation must come from within. Don’t do too much, too soon. Start with a simple, low-intensity, balanced program that you perform three days a week. Combine flexibility exercises with aerobic activity. 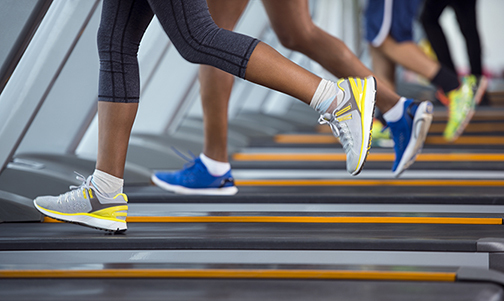 Studies have shown that people who must drive eight miles or more to an exercise facility are less likely to stick with a program. Work out with family or friends. Working out with someone you like will make you less prone to skip your workouts. Incorporate exercise into your daily routine. 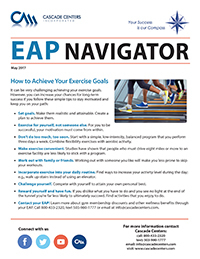 Find ways to increase your activity level during the day; e.g., walk up-stairs instead of using an elevator. Compete with yourself to attain your own personal best. Reward yourself and have fun. If you dislike what you have to do and you see no light at the end of the tunnel you’re far less likely to ultimately succeed. Find activities that you enjoy to do. 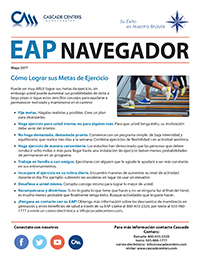 Learn more about gym membership discounts and other wellness benefits through your EAP. Call 800-433-2320, text 503-980-1777 or email at info@cascadecenters.com.